So, I got holla'd at the other day. It has been a long time since that has happened (oh, when I was about 16 and my friends and I hang out at the mall for fun) so it stuck out to me. It also stuck out to me because um, the boy who holla'd was around 15. And no, I was not wearing this outfit. I was wearing leggings and a t-shirt while walking my dog in the park. I didn't say anything, I just ignored it and kept walking, but he persisted: "hey girl, come over here and talk to me." I completely ignored him but I really wish I would have said something witty and made him feel silly. "You're on track to become a predator, kid." "I'm 26 and have been married for 4 years, so you are promoting infidelity." I would have been flattered, too. Sure, he was 15, but hey, you must have looked hot for him to make such a fool of himself. Although 15-year olds rarely need an excuse to embarrass themselves. I'm not sure where I'm going with this. Oh yes: You've still got it! Woot! 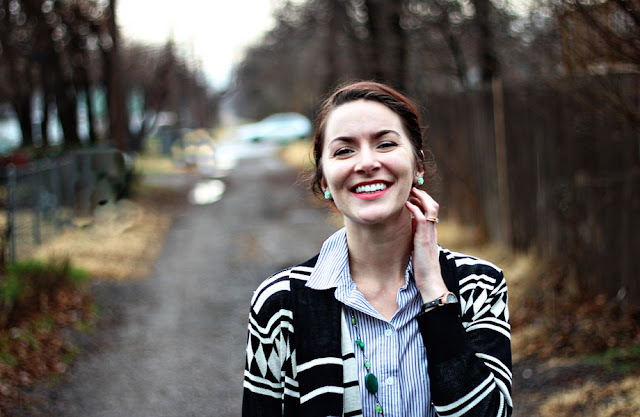 :) I love the turquoise jeans with the Aztec cardigan. Love! 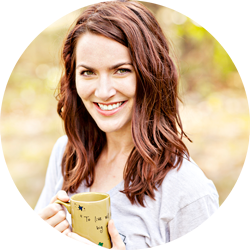 I just discovered you lovely blog through a link-up...I'm so happy to now be following along! I'm so glad you're here, Sarah! This is such a cute outfit, I love the bright color of your pants. Stopping by from WWIW. I love the 4th picture! So pretty! this color/pattern combo is great together I love it. and the shoes go with the whole vibe wonderfully! ha we link up to all the same parties I see! small world. Thanks Sara! I love meeting people through link parties! Thanks so much! I actually have no idea where the necklace is from - it was a gift. So sorry! Anyway, LOVING the splash of green pants!!!!!! So pretty!!!! hahahah! love this story! it's great to know others (Especially young boys) think we're pretty! you look so pretty and I may need to steal this sweater from you! Thanks, Chioma! I've been wearing the cardigan ALL THE TIME! love the cardigan! i have something similar and recently wore it with my red denims! too funny. i've had young boys try to talk to me and honk while i'm driving. i just give em a smile, then roll down my back window and have my two kids wave at them! Hahahahahaha! I LOVE that! So funny! Ok so I have been wanting to buy a pair of oxfords and thing they look ridiculous on me. I wish I could pull them off like you are doing! They are so darn cute on you! You should totally get some oxfords!! I love the laid-back look and they're so comfortable. I actually wear them to work with skirts too! Love your outfit! 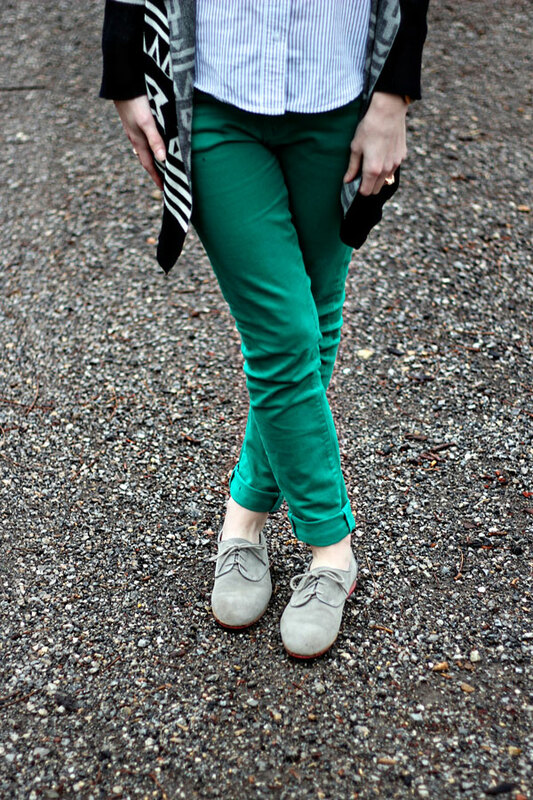 Those green pants are so cute, and I love your oxfords! Thanks Caroline! I'm so glad you're here! I love this cardigan! You look so cute. That is hilarious about that guy. I was walking down the strip in Vegas (by myself) heading back to the hotel after shopping, and this young guy yelled 'Hey! Are you alone?!" Creeper. I practically ran back to the hotel. Hahaha! Um, I don't know how he didn't realize that asking someone if they're alone is a HUGE red flag!? Vegas is so fun but it can also be so terrifying! It's such a fun pattern, isn't!? I'll have to check out the one you bought! That sweater is lovely, and goes so well with your green pants! And yes, it's a weird feeling. I hated that it made me feel a LITTLE bit good, but it's the truth! Anyone would have been flattered though I am twice that boy's age. I love this Aztec Cardigan and you always make some fun outfits out of your Green Pants. Cute earrings, too. Interested to Guest Post for me in February? Let me know. Haha, yes! I'll put something together and then email you! THis is super pretty! I love the whole blouse, sweater, jeans combo with all the colors and patterns! You really nailed this one, you look amazing! Thanks so much - this has turned out to be one of my favorite outfits! Oh my! I'm absolutely OBSESSED with this outfit. Like, I literally want to recreate it right now. I almost bought those DV oxfords at TJ Maxx, and now I'm wishing I had just pulled the trigger. You are so sweet, Kristina! I'm so glad you are following - I am following you too! Oooo I love this cardigan! Great look. Thanks Jennifer! That cardigan has quickly become a favorite! Aw, thanks! I am so glad to be a part! I am going to follow that board now! I love this outfit. I've been looking for a cardigan like this for a while now. Mostly in thrift stores though so no luck yet. Loving your blog!